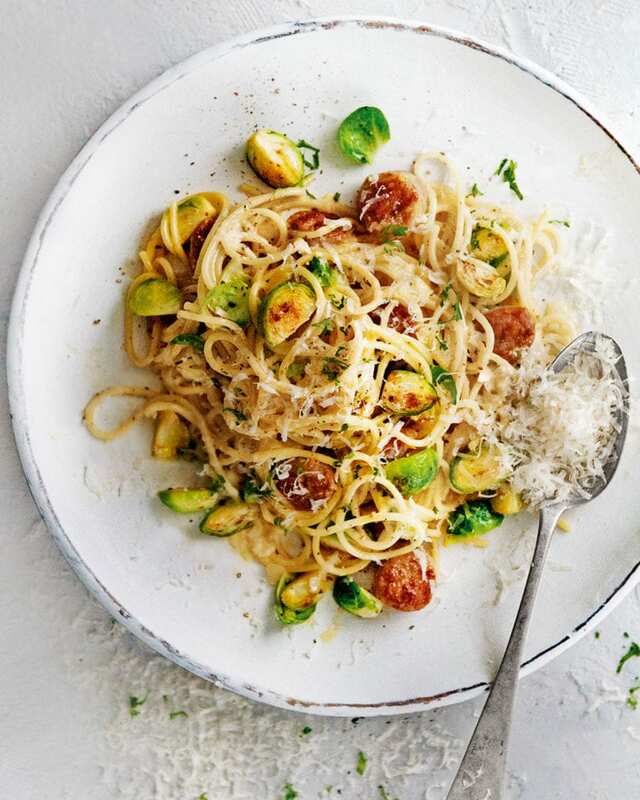 Our creamy carbonara for two is a great way to use up leftover brussels sprouts and sausages. And if you don’t like sprouts then swap them for any cooked leafy green you like. Bring a large pan of salted water to the boil, then cook the spaghetti according to the packet instructions. Drain, reserving a cup of the pasta cooking water, then return the pasta to the pan and stir in a drizzle of olive oil. Meanwhile, heat another drizzle of oil in a non-stick frying pan. Fry the sausage slices for 8-10 minutes until golden and cooked through (see tip). Add the sprouts to the pan for the last few minutes to heat through, then remove the pan from the heat. Meanwhile, crack the eggs into a bowl, then beat with half the parmesan and the lemon zest. Add the sausage and sprouts to the spaghetti pan, toss, then add the egg mixture and toss again (off the heat) until it thickens. Add a little reserved pasta water to make a smooth sauce. Squeeze over the lemon juice, then season with salt and pepper to taste. Serve sprinkled with the remaining parmesan, chopped parsley and freshly ground black pepper.